LaDelvin is a mother of two and an alumna of the Flint Family Literacy Program at the Christ Enrichment Center (CEC) in Michigan. CEC is a local partner of the National Center for Families Learning (NCFL), and has provided programming to promote learning opportunities for local citizens of all ages for the past 30 years. LaDelvin was recently invited to share her family literacy story at the 2018 Families Learning Conference. When LaDelvin was growing up, her parents emphasized the importance of school. She was raised in a two-parent household and was the youngest of five children, plus one adopted brother. Her father started working on the production line at the local General Motors plant, eventually making it to management. In 1963, her parents were the first black couple to purchase a home in their neighborhood—they were a model of upward mobility within the local black community. All of LaDelvin’s older siblings graduated from high school, and they all either enrolled in a college or pursued a trade degree. Her family’s relative prosperity and educational attainment, however, would not be a harbinger of the path LaDelvin would take. When she was a teenager, family tragedy struck not once, but twice. When LaDelvin was 13 years old, her father suffered a fatal heart attack. Then, seven months later, her brother Ewell Jr. was brutally murdered—he was just 25 years old. LaDelvin’s world was turned upside down. “I felt like my life was over before it began,” she recalled. LaDelvin found a positive outlet in music, learning to play clarinet in middle school and eventually joining the high school marching band. Academically, however, she never obtained the credits she needed to graduate on time. By 18, she had dropped out of high school twice largely due to persistent struggles in math class. Despite not having her GED®, LaDelvin was determined to provide for herself, and her longtime passion for nails and salon work was a way to do so. She enrolled at a cosmetology school in Flint and worked in various salons, building up a reputation as a skilled nail artist. In the fall of 2004, her son Deaven was born. Years passed, work was steady, but when it came time to supporting Deaven’s reading and school work, the experience was painful for both mother and son. “Deaven had issues with reading...It was traumatic for both of us to get him to sit down and read, and I might have went about it in the wrong way,” LaDelvin admitted. Then in 2007, LaDelvin’s mother passed away, leading to another difficult stretch. She suddenly became the guardian of her adopted brother. In and out of jail since he was 14, he was saddled with anger and mental health struggles. During this period, LaDelvin made a reluctant decision to apply for state assistance. “For me, I felt as if I had hit rock bottom,” she said. But needing assistance indirectly provided LaDelvin a spark. “I knew that I needed to do something, so I attended night school to obtain my GED®,” she said. She passed all of the sections except for math. LaDelvin was exasperated, but she didn’t give up, finally giving the nearby family literacy center, Christ Enrichment Center (CEC), a chance. She had never told most of her family that she didn’t graduate from high school. It was a secret she’d kept for over 20 years. But after years of harboring this burden and what she calls a personal shame, LaDelvin finally had enough. In the fall of 2016, at age 42, she enrolled in the CEC Flint Family Literacy Program. During her enrollment session at CEC, LaDelvin initially balked at the idea of a lengthy commitment. After all, she says, her plate was full. She now had two sons, and she was still taking care of her adopted brother. Finances were tight. At the time, LaDelvin was unaware of the value in committing to family learning and literacy programs long-term. Soon, though, she was participating in a wide range of the onsite programming for up to 20 hours a week. This included GED® courses, and NCFL’s Parent Time and Parent and Child Together (PACT) Time® classes—both multigenerational approaches to encourage families to learn together. During PACT Time, LaDelvin learned to improve as the first teacher of her children while practicing interacting with her younger son, Desmond, in a supportive environment. With Parent Time, she met other young mothers and formed a tight-knit cohort. By increasing her network, LaDelvin was able to work with CEC staff members on setting high expectations for her kids, focus on her children’s progress, and extend learning opportunities at home and in the community. 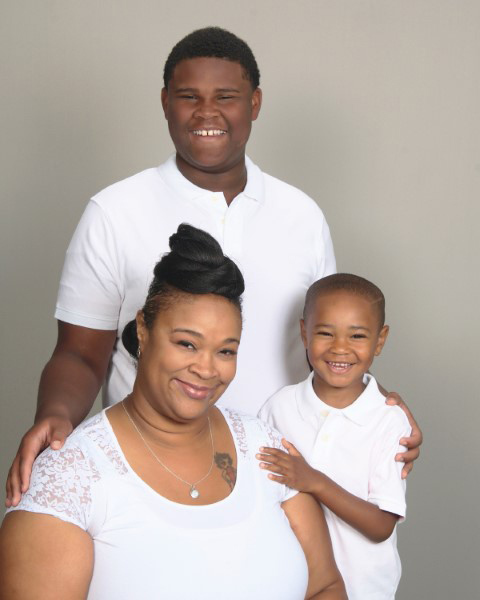 The family literacy program at CEC not only helped LaDelvin study for the GED® and become a better parent for her children, it sparked within her a lifelong commitment to help others who are struggling with the same issues she experienced throughout her life. After a year in the program, LaDelvin was asked by the Flint & Genesee Literacy Network to join their team as a Flint Recovery Corps Member, serving as the family literacy system navigator. In addition to working at her home salon, LaDelvin now carves out time to embrace work as a family literacy system navigator. She provides local families resource packets about ongoing issues in their community, such as Flint’s water quality issues. She also provides ideas and suggestions for others to implement PACT Time. November is National Family Literacy Month®, a time when we celebrate families who are working to better their lives and the tireless efforts of those working in family literacy and family-focused programs. On Fridays in November, we're sharing an inspirational story of an adult learner who has participated in an NCFL family literacy program. Toyota, one of the nation's most successful corporations, began a partnership with NCFL in 1991. In addition to a commitment of more than $35 million, Toyota has also contributed a wealth of in-kind support — including advertising, planning and management expertise — to form one of the most progressive corporate/nonprofit partnerships in the nation. Three major programs have been developed through the Toyota partnership based on the family literacy model of parents and children learning together. These models have influenced federal and state legislation, leveraged local dollars to support family literacy and led to successful programs being replicated across the country. The Dollar General Literacy Foundation began partnering with NCFL in 2006. A signature effort of this partnership is the National Literacy Directory, a resource that launched in 2010 and strives to reach the 35.7 million adults ages 18-64 who do not have a high school diploma by guiding them to better-paying, more stable jobs. The National Literacy Directory contains over 10,000 educational agencies located across the United States and has a dedicated toll-free number to help support those wanting to pursue educational opportunities in their communities. Dollar General also provides support for development of NCFL’s innovative family learning resources centered on financial literacy and Parent and Child Together (PACT) Time®. PNC Grow Up Great believes deeply in the power of high-quality early childhood education and provides innovative opportunities that assist families, educators and community organizations to enhance children's learning and development. PNC Grow Up Great has partnered with NCFL since 1994 to advance early literacy and learning resources for vulnerable families. Current efforts supported by PNC include a collaborative initiative in two at-risk Detroit communities that engages families to support vocabulary development for children under age 5. NCFL's work is also featured on the PNC Grow Up Great Lesson Center website. The Lesson Center includes over 100 free, high-quality preschool lesson plans and research-based instructional techniques and strategies. All lesson plans contain Home/School Connections printouts, in English and Spanish, to help families extend and reinforce the learning at home. NCFL has partnered with the W.K. Kellogg Foundation since January 2016. The Foundation is currently supporting a dynamic two-generation family engagement initiative that expands NCFL's Family Learning model into select Head Start programs nationwide. NCFL's model presents an innovative way to support Head Start programs in meeting outcomes aligned with the Parent, Family, and Community Engagement Framework. Better World Books selected NCFL as its domestic literacy partner in 2005 and has raised more than $1 million to support NCFL’s work and donated more than $15 million to support literacy and education efforts worldwide. Better World Books is a triple-bottom-line online bookstore, working equally for people, planet and profit. Each book purchased powers literacy across the world. Better World Books’ support of NCFL has provided books and workshops to families after Hurricane Katrina, donated large book donations to literacy programs and families nationwide and fueled innovative family literacy and learning programs and resources in libraries, schools and community-based organizations. In addition to their work for literacy and education, Better World Books diverts books from landfills and offers carbon-balanced shipping. In 2013, NCFL began a partnership with the Gates Foundation to ensure that our network of students, teachers, and families thrive among recent shifts in standards-based education. NCFL will leverage the unique strengths of our award-winning Wonderopolis® platform to build upon the growing teacher network that uses the resource for core daily instruction and as a basis for professional growth. NCFL has partnered with the Goodling Institute for Research and Family Literacy at Penn State University since 2001, working collaboratively to further research, professional development, and policy efforts for family literacy and intergenerational learning. The work of this partnership includes, but is not limited to, a strong research strand at NCFL's national annual convening, the Families Learning Summit; advocacy for family literacy and learning to further support for and inclusion of family-focused education in new and ongoing legislation; and dissemination of the latest research, resources, information, and professional development opportunities for literacy and learning practitioners and advocates, including the Certificate in Family Literacy provided by the Goodling Institute.